Stunning duplex apartment, extremely bright and quiet. On the 6th and 7th floor with elevator, of a 70’s building with doorman service and a beautiful courtyard. 2 bedrooms and 2 bathrooms, modern and very comfortable. Entering on the right there is the main living room, with 3 couches, a library and a TV. 2 large door-windows leading to the balcony. On the opposite side, there is the dining room with another balcony, a huge refrigerator and the kitchenette, with electric oven and dish washer. In front of the entrance a corridor leads you to the light blue bathroom, with shower, window and washing machine. 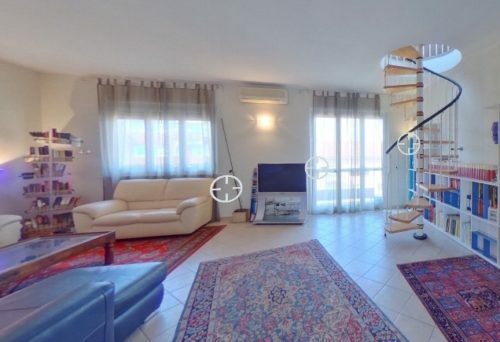 From the living room you can go upstairs with a spiral staircase. On this floor there is another living room with a couch, an armchair, some drawers and a piano. The second bathroom, with window, shower and Jacuzzi. An aisle with closets leads you to the 2 bedrooms. The master bedroom has a double bed and a huge wardrobe. The other bedroom has a single bed, a baby cot and some cabinets. Air conditioning in each room, high speed internet. Safe residential area, near new City Life area, very good connected by public transports. 5 minutes walking from the metro station Gerusalemme M5. Walking distance from every kind of shops and service. 30 minutes by tram from Duomo square and 15 minutes from Arco della Pace/Parco Sempione.